The Sensuka suburb of Rilito is built around a fine harbour that has long made it a centre of the local fishing industry. In the last decade, however, the neighbourhood has acquired an unexpected fashionableness, owing to the curious aristocratic pastime of capestadiven -play acting as fishermen and fishmongers- that was made popular at court by the Emperor’s head concubine, Biruégh. Nothing now amuses the imperial courtiers more than to head down to Rilito harbour for the day, where they don extravagant “South Seas fisher-folk” costumes and set out on a specially appointed “fisher-folk barge”, amply provisioned with fine food and drink –especially drink. A few fishermen from Rilito are brought along to do most of the actual fishing, although the lords and ladies will occasionally take turns dangling a fishing rod over the side of the boat. It is only when the merry crew returns to shore, however, that the real fun begins. The courtiers, usually in quite a lively and rambunctious mood by this point in the proceedings, will head over to the fish market stalls by the harbourfront. There they joyously take on the role of “fishmongers,” which mostly involves more drinking while treating the market-goers to loud praises of “their” catch –always amid a profusion of off-colour double entendres and other witticisms. As all of the actual fish market stalls were deemed too unclean and smelly, Biruégh ordered the erection of a “South Seas” fish stall, built out of the finest imported woods, to be reserved for the exclusive usage of the lords and ladies of the court. The carved spires of this fanciful construction are visible on the right side of the picture. On the hilltop in the background one can make out the rooftops of the sanctuary of Marikora, in which the famous cloud oracle is housed. 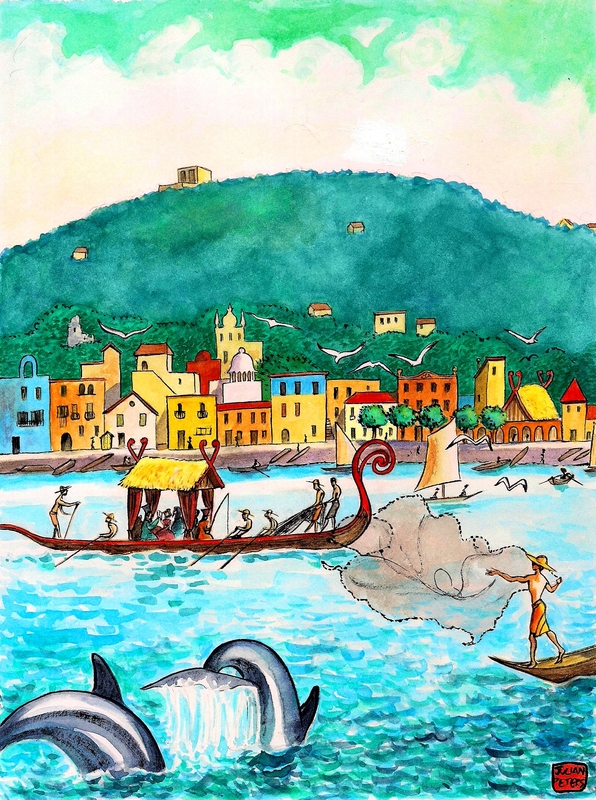 This entry was posted in illustration, Imaginary City, painting and tagged drawing, fishing, fishmongers, imaginary city, rilito, sehnsucht, watercolour. Bookmark the permalink. I was looking for a shepherd’s shelter in the mountain, yes, yes, there it is! Nojorbun! You’re absolutely right, the play acting bergers and bergères of Versailles were my main inspiration here. And there is something Egyptian about the foreground fisherman especially. I guess because he’s depicted in “composite” or “twisted” perspective -terms I learned recently in the art history survey class I’m TAing.